The 50th anniversary of the All American Quarter Horse Congress was truly one for the books. And as a vendor who worked the event, and a spectator who watched the events, I want to say thank you to everyone who put in the long days to make the events possible and the teams of trainers and owners who showed their horses with such grace and talent. Congress 2016 may be over, but trust me, it will never be forgotten. There were countless things to do this year at Congress but I have chosen to highlight some of my favorites. There was always something to do while at Congress for exhibitors, spectators, vendors, and trainers alike. The events kicked off with the PBR on October 14th, this always draws a huge crowd and gives everyone a change of scenery from the daily dose of horses. Who doesn’t love watching men ride a 2,000-pound beast? It can be truly incredible to watch human and animal athletes perform together like they do with the PBR. Always a crowd favorite is the freestyle reining which was another sold out event. It was held on October 15 and was arguably one of the most heartfelt free style reining classes I have ever seen. Fredrick Win stole the crowd with his performance that evening. Fredrick was born without a partial right leg, and has been an ambassador for para reining since 2013 where he demonstrated his riding abilities at the AQHA World Show. This night was also special as it marked the first time a para-reiner ever competed in the freestyle reining. Did I mention that Dave “Showtime” Meyer was the MC for the Concert?!?! I have truly saved the best for last…The Kimes Ranch VIP Concert featuring Rob Carona, Angie Keilhauser and Trick Pony. This event turned out to be a party that could only be compared to one from The Great Gatsby. The party started with a red carpet entrance, VIP guests were escorted to the VIP section where they were treated to an exclusive one on one experience with Trick Pony. Guests were also gifted a special edition VIP hat for them to take home as a reminder of Kimes Ranch throws a concert! Let’s not forget about the drink tickets and Kimes Koozies! It wasn’t long before the entire dance floor was filled with our guests as they danced away to the tunes of Rob, Angie and Trick Pony. We had Mallory of Impulse Photography shooting the shenanigans of the concert and she got some amazing shots of our owners Matt and Amanda, as well as our marketing and sales department team: Lindsay, Doug, Terri, and Garret. 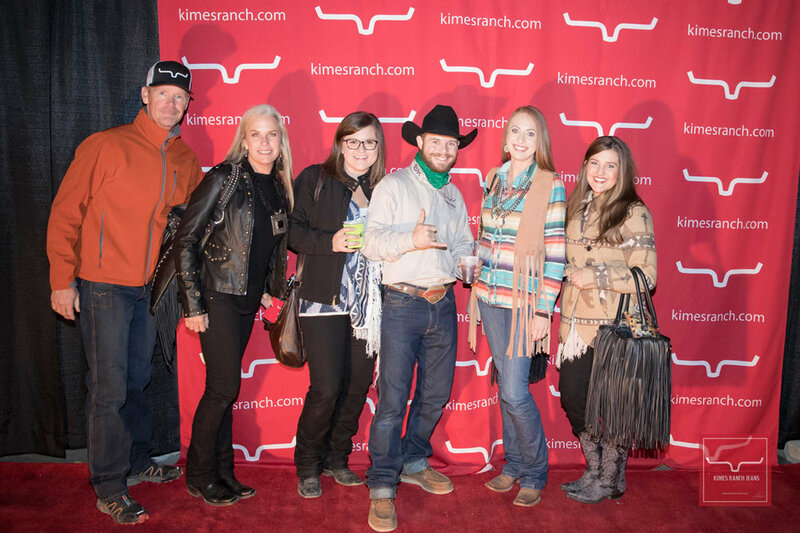 Let’s not forget your Kimes Ranch Jeans sales reps who were with you the entirety of the trade show: Tricia, Alisha, Emily, Blake, Katy and Megan. I don’t think many will soon forget the Kimes VIP Concert. The All American Quarter Horse Congress will always be one of my favorite times of year but for many reasons this year was by far my favorite. Definitely one for the record books, and I know I’ve already said it, but to those who were apart of this years All American Quarter Horse Congress….THANK YOU! Chip, Tricia, Emily, Blake, Alisha and Katy- Just a few of the KRJ Family who was with you the entire Congress, walking the red carpet to the event! Rob, Angie and Trick Pony taking a bow after one heck of a show! Good luck and safe travels to those traveling to the AQHA and APHA World Shows, as well as the NRHA Futurity! enter the password: amanda to view pictures. RodeoChat Spends The Weekend Checking Out The Ranch Rodeo Industry At The Nile In Billings, MT!